I’ve been making my share of icebox desserts this summer. They’re one of my favorite it’s-too-hot-to-bake desserts. Really, though, I’m happy most any time of the year with an easy, cold, amazingly delicious dessert. 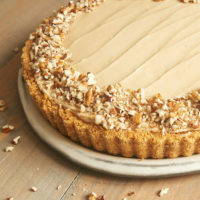 The inspiration for this pie came a couple of days ago when I spotted a jar of Trader Joe’s salted caramel in my pantry. I’ve never been that inspired to improve my caramel-making skills, so store-bought is just fine with me most of the time. And, of course, make it salted caramel and we’re really talking! When I also spotted some chocolate wafer cookies, I knew I was in business. 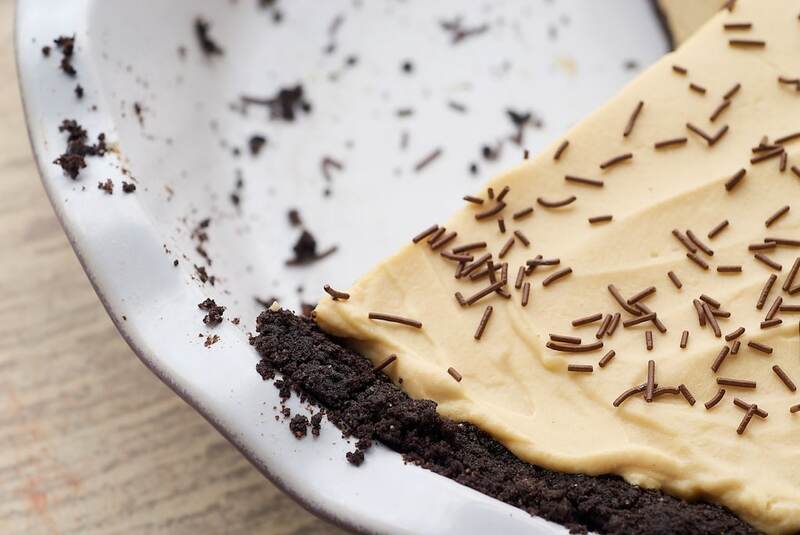 We start with a simple cookie crust made of just three ingredients. I used Nabisco’s Chocolate Wafers. I love their dark chocolate flavor and knew they’d work so very well with caramel. If you can’t find them, chocolate graham crackers or even Oreos will work. The filling is quite simple itself. Again, just a handful of ingredients make this creamy, caramel-y filling. The saltiness of the caramel is subtle, but you can bump it up a bit more by adding a few pinches of salt. This will also, of course, work just fine with non-salted caramel. Make it as is, or add a bit of salt to the mixture. If your jar of caramel is a little bigger than 10 ounces, go ahead and use it all. 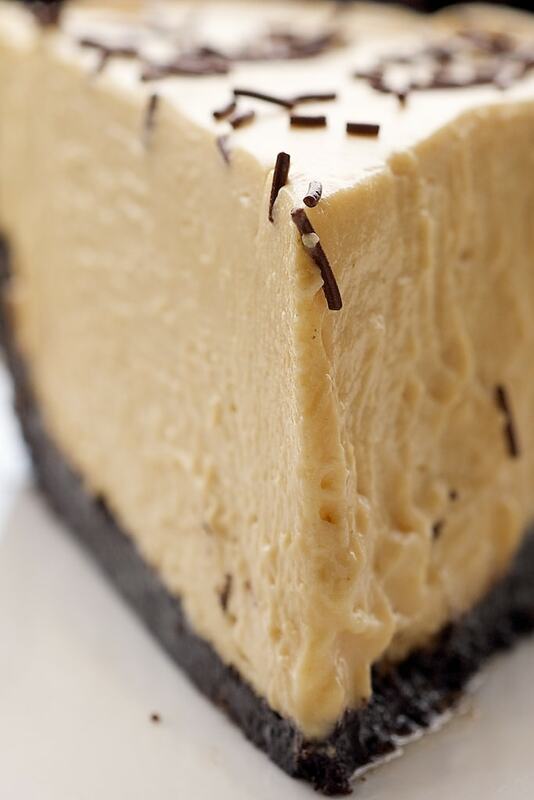 The extra caramel won’t have much effect on the texture of the filling. Quinn has asked me to tell you that this is his favorite dessert ever. I have to admit that it ranks pretty high for me as well. My only complaint is that I should have made it when we could share it with friends. It’s far too dangerous to have this one all to ourselves. Combine all crust ingredients in a medium bowl, stirring until moistened. Press mixture on bottom and up sides of a 9-inch pie pan. Bake for 10 minutes. Allow to cool. Mix cream cheese, confectioners’ sugar, vanilla, and salt until combined. Mix in caramel. Whip cream until soft peaks form. Gently fold whipped cream into cream cheese mixture. Sprinkle top of pie with chocolate. Pour filling into baked crust. Refrigerate 8 hours or overnight before serving. Keep pie refrigerated. *To get 2 cups of chocolate wafer crumbs, you will need almost an entire 9 ounce package of cookies. Pulse cookies in food processor until finely ground. Alternatively, place cookies in a sealable plastic bag and roll over with a rolling pin until ground. Wow, this looks so amazingly good. I would be scared to make this without having my friends over to help me reduce calorie intake. Just added the recipe to my weekend to-do list. Just noticed that ask that the oven is preheated, but then don’t say what gets baked (I’m assuming the crust) or for how long. I’d like to make this soon, but trying to figure out if you really need the oven or not! Thanks! Emily, thanks so much for catching that! I’ve updated the recipe. Enjoy! Hi, this recipe looks amazing as I am an ‘anything caramel dessert’ fan! I live in Australia and am not familiar with a jar of salted caramel. Is this similar to caramel sauce/topping? Wonder what I could substitute for it? Thanks! 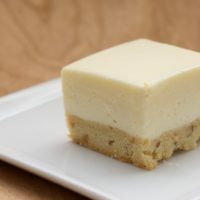 This might be my favorite dessert ever and I haven’t even tried it yet!! Sarah, the salted caramel I used is indeed a topping. I’m sorry that wasn’t clear in the recipe. I’ll update that now. this looks soooo good!! I can’t wait to make it!! This pie looks so fabulous! Awesome idea! Thank you so much. I too have been in the icebox pie mode. First I did lemon icebox but added lime zest to the traditional ingredients with a graham cracker, brown sugar, walnut and cinnamon crust. Then I did your Cherry Cream Cheese Pie. 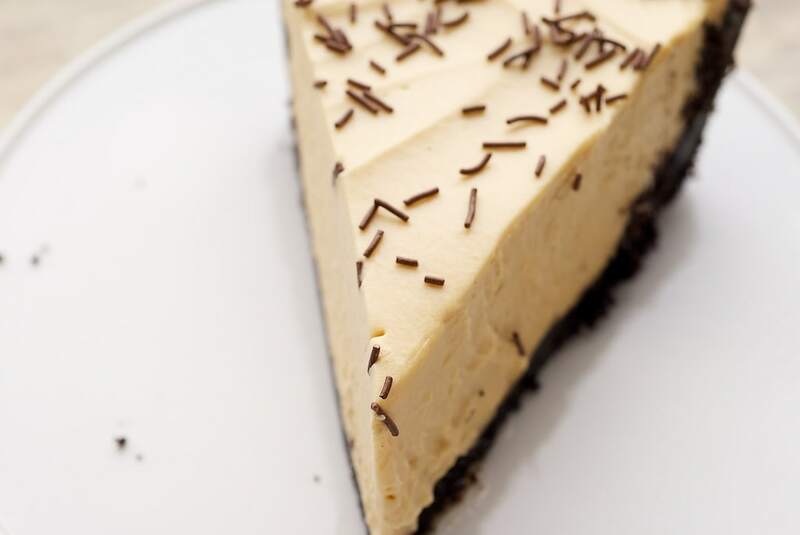 Then I did your Chocolate Peanut butter pie…because I had used graham crackers two weeks in a row I did chocolate graham crackers and it was spectacular. Now, you’ve solved my dilemma for this weekend…just in time; YAY!!! this sounds incredible! 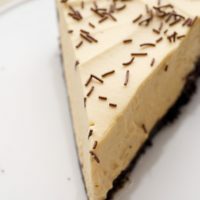 I love the dark chocolate crust, it looks so decadent! 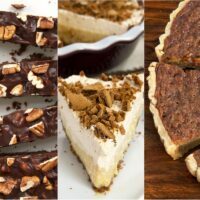 Mimi, I’ve never made an icebox pie with a traditional pie crust. It’s worth a shot! This is in the frig for the chill time. Judging by the tasty remains in the bowls, this will be fabulous. I really don’t want to wait for it to set up before diving in! Thanks for posting. I made this Saturday for my FIL’s birthday. I did a Orea crust (about 10 oz. of Oreos crushed up with 1/4 cup of melted butter) and skipped the extra sugar in the crust. Turned out amazingly well! So yummy and rich…all 6 adults gobbled it up! I just started making this and baked the crust up… Is there a typo in the ungredients? Half a cup of butter turned my crust into a huge greasy mud puddle of chocolate crumbs and I had to use a paper towel to soak up the pool of butter that collected at the bottom and reshape the crust with a spatula (if that even will end up working). I wasted a lot of time and elbow grease on the first half of this recipe, so I’d next time try it again wih 1/4 cup butter, like Charity mentioned above. Wish I had listened and did some research on other crumb crusts prior to this. Robin, it’s not a typo. When I make cookie crusts, my usual recipe is 1/2 cup butter for every 1 & 1/2 to 2 cups of cookie crumbs. I’m sorry you had trouble with it! I can’t wait to this! I wasn’t able to find chocolate wafer cookies and am wondering if you still think I need the sugar when using chocolate graham crackers? Thanks for your help! Emily, you can leave out the sugar. It should be just fine! Enjoy! BOB was a huge hit Friday night. 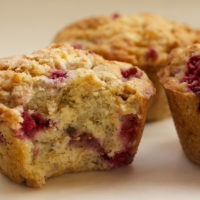 I did this recipe in muffin cups. 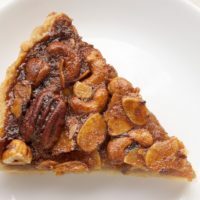 I made the crust with chocolate graham crackers and added pecans…no problem with the butter. I used 2 tablespoons in each muffin cup and tapped it down with the bottom of a pint jelly jar; then put it in the oven for 5 minutes. I made the filling and put it in the muffin cups over the cooled crusts. For presentation I took the “pies” out of the muffin cups and placed them in the middle of a dessert plate. I made a chocolate ganache with a touch of Amaretto and swirled it in circles around the “pie”. Whole Foods sells something they call Chocolate Pearls…I used those instead of the sprinkles. As I said…HUGE hit!!! PS. No Trader Joe’s in Memphis and no salted caramel at Kroger, Whole Foods or Fresh Market and I refused to drive to W/S in Germantown. So, I added a tablespoon of Fleur de Sel to a jar of caramel topping…PERFECT!!! Made this today and topped with some baked bacon pieces lightly dusted with brown sugar. Can’t wait to try it! and other spring allergens, and keep allergy symptoms under control. add peanut butter and melt it. That’s where desiccant dehumidification comes into the picture. The irritants in the home that can trigger asthma are a lot; cigarette smoke, perfumes, aerosol sprays, fumes from cleaning products and paints. I’ve made this twice. Both with success. The second I used the food processor for the cookie crust. That didn’t turn out as well as the crush in the ziptop bag method. I used whiskey and 1 1/4 tsp fleur de sel in the caramel cream cheese mixture and Baileys in the whipped cream. I didn’t use the salted caramel sauce as I wanted to control the salt. Excellent! Entered my boozy version (with praline layer) in last year’s CA state fair – first place ribbon and best of class for refrigerated pies. Well done, Jennifer! That might work, as the filling is a whipped cream base. If you try it, let me know how it works!